Be part of the Creation and Support Indie Music. As a long time supporter of Yossi Sassi and the music he creates i am hoping you join me in supporting his upcoming album. I was thrilled to be able to submit his prior album for Grammy Consideration and look forward to doing the same with this album but it won't happen without your support please visit the crowdfunding link , time is of the essence. I would like to invite you to be a partner in creating my fourth album, an album that will come out to the world because of you. Only with you we’ll be able to distribute the album, and go on a new path with it into the world, a path which you will be a real part of, like never before. The fourth chapter of my band’s journey, which we already started creating, is a direct continuation of the band’s previous albums, but with many changes compared to its predecessors. The album will be recorded with the influences of ‘Oriental Rock Orchestra’, which is our live show these days. It is an ensemble of nine musicians, the perfect combination between East and West, acoustic and electric. The ensemble has been together for nearly seven years, in studios and touring abroad. To me it’s an actual family, including Danielle Sassi, my 16-year-old daughter who’s playing the flute. The album will be recorded in late September on the secluded island of Santorini, Greece. Sea, disconnection from the routine, day-long sessions, spontaneous jams and more are part of the week’s planning on the island. Through the journey to Greece I return to my roots. My late grandfather, the original Joseph Sassi, was born in Salonika, and I have a Greek side that sets the tone for quite a bit – the creation of the bouzoukitara, the Balkan rhythms in the songs and the endless inspiration. All the musicians will be recorded together, as an orchestra, just like in a classical concert. In addition, some of the songs will also be recorded “without a click”, with a more natural dynamics and without an absolute clock that dictates the pace. Minimum edits, minimum intervention. What you’ll hear is what everyone played, along with everyone else, on the island. The studio I chose is Black Rock Studios, chosen by the BBC as one of the best studios in the world. Who will participate? Ross Jennings, the amazing vocalist of Haken, the super-prog band playing with Mike Portnoy’s Dream Theater repertoire. Other guests are expected: the gifted pianist Roy Zuaretz, The virtuoso violinist Michael Greilsammer, and other international artists that we have to keep as a surprise for later. We will finish the album in 2017 and it will be released in 2018. In over 25 years of professional music creation, this is the first album I’ve ever recorded using mass funding. It will happen because of you. I could do it as I always did, but I chose to make you, the music lover, a full partner for the work, and I really want to give you special and personal gifts & experiences. ​Yossi Sassi is an Israeli musician and producer. 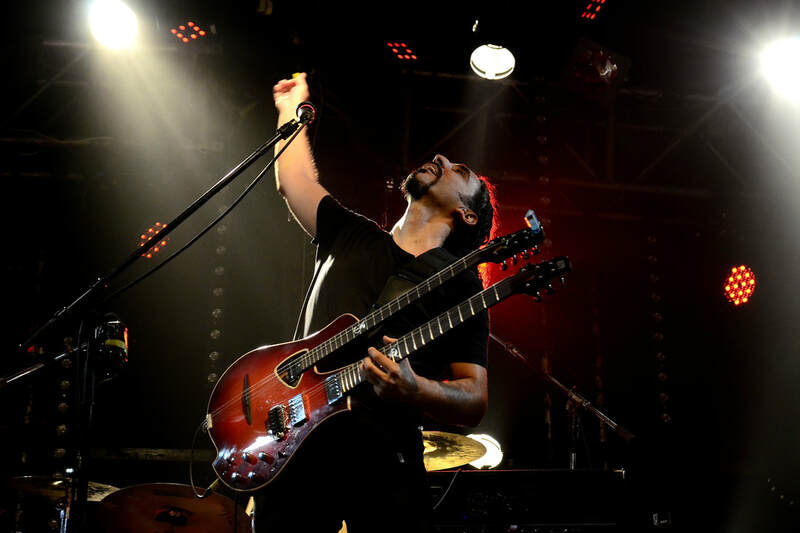 He invented the world-known Bouzoukitara musical instrument, and co-founded the successful metal band “Orphaned Land”. In 2011 He began his solo career that combines rock & traditional Mediterranean music. His first album, “Melting Clocks”, was recorded in 2011 during a break between intensive tours with Orphaned Land. The album included collaborations with singer Marina Maximilian, ex-Megadeth guitarist Marty Friedman and other artists. The second album “Desert Butterflies” was released in 2014 and included the study of ancient instruments. There were also collaborations with interesting artists, including Guns N’ Roses guitarist, Ron “Bumblefoot” Thal. The third album, “Roots and Roads”, was released in 2016 and it’s a very personal album that was recorded in light of a difficult period. This album has been submitted to the Grammy nomination. The Yossi Sassi Band Album no. 4 is the reason that we are here. The album launches a new path, a path that also belongs to you. From the Roots and Roads Album nominated for Grammy Consideration.